I bought B-100 (Sustained Release) by NOW. Delivery is always fast. I take one a day & know Im getting all my Bs! Just wish it had about 2000mcg of B12! Usually the b's go in and out of the system quickly. We are trying NOW Foods Vitamin B-100 to see if it really slows this down some. 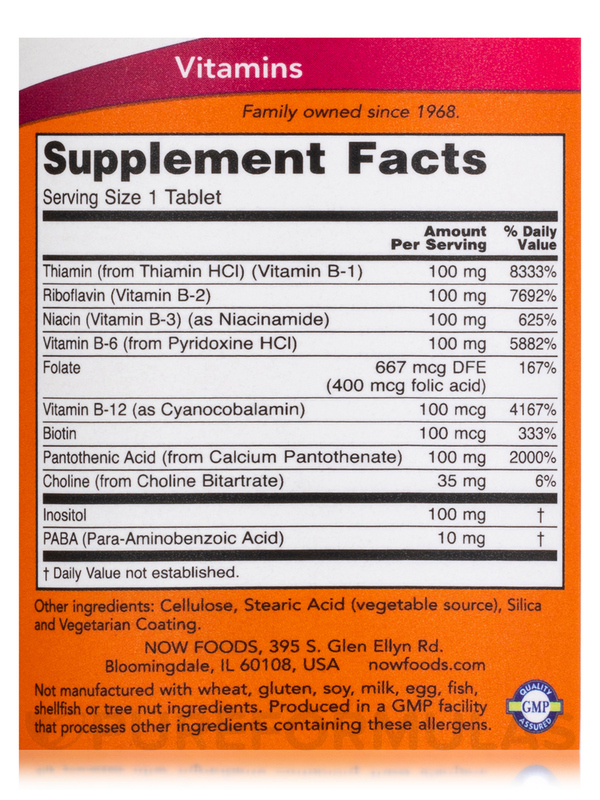 B-100 Tabs provide a full complement of B-Vitamins plus Choline and Inositol. Together‚ these vitamins work to support energy production‚ are critical for the healthy metabolism of homocysteine‚ and promote a healthy nervous system. 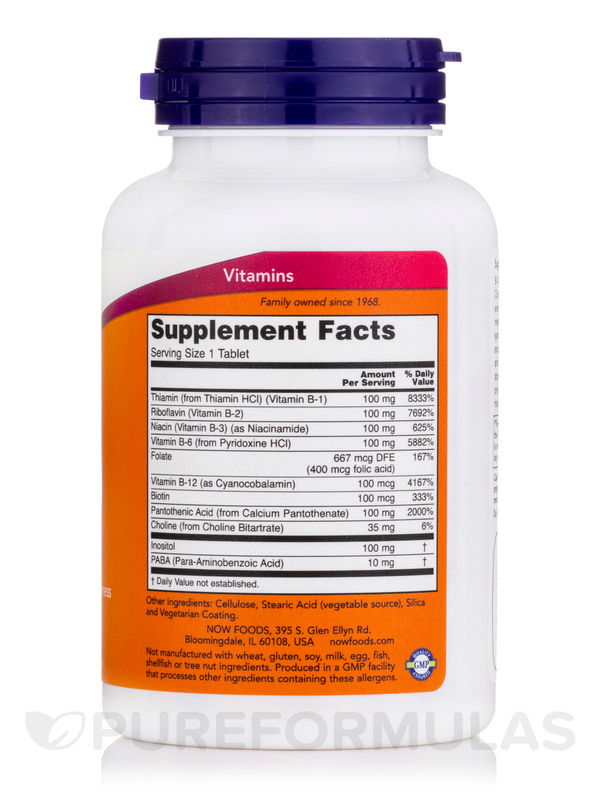 B-Vitamins are water soluble‚ and with the exception of B-12‚ they are not stored in the body and thus require daily replenishment. 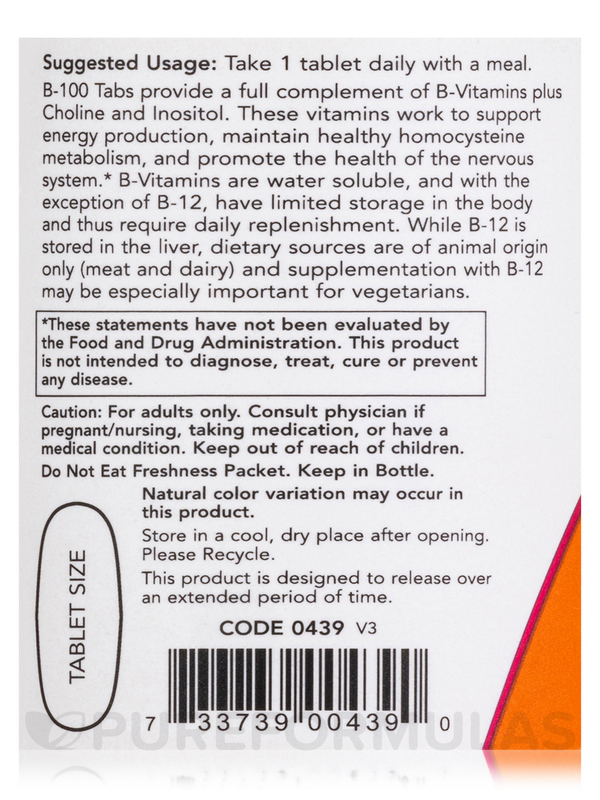 Because dietary sources of B-12 are of animal origin only (meat and dairy)‚ supplementation may be especially important for vegetarians. Other Ingredients: Cellulose‚ stearic acid (vegetable source)‚ silica and vegetarian coating. Notice: Natural color variation may occur. I can feel the difference when I don't take B-100 (Sustained Release) by NOW. It doesn't give you a rush or anything but it does help the energy level. 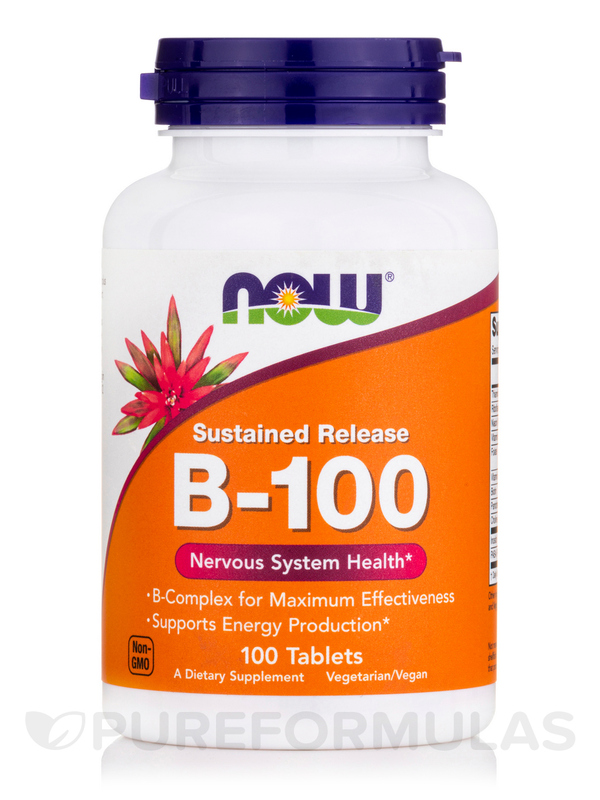 "NOW" is a great brand and the Vitamin B-100 is excellent value. I take one a day &amp; know Im getting all my Bs! Just wish it had about 2000mcg of B12! Would like the convenience of a little extra B12! Love that these are v caps. 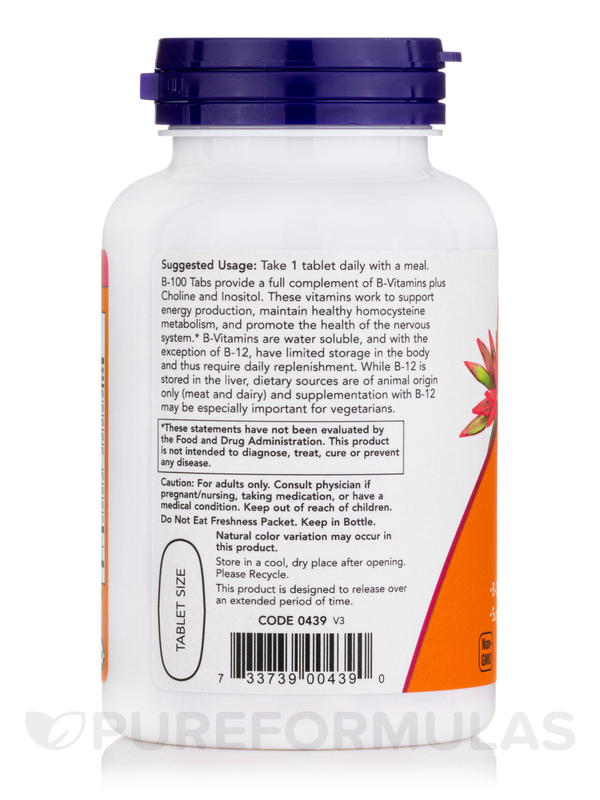 Have been taking this supplement for over 10 years have had no issues with them at all. Started taking them to ease stress. Works Great! Can notice the difference when I run out and have not had them for a couple of days. They definitely make me Happy Happy Happy! Great product. Easy to order and very quickly delivered. Product has exceeded my expectations. I will definitely continue to use this vitamin.